To fully realize the biggest chest measurements possible you must pay special attention to the rib cage. One of the things I most regret is the fact that when I started to work out I didn’t pay enough attention to enlarging my rib cage. I hope I can help a lot of beginners in this respect. Please do specific rib cage work, especially in the first year of your training. 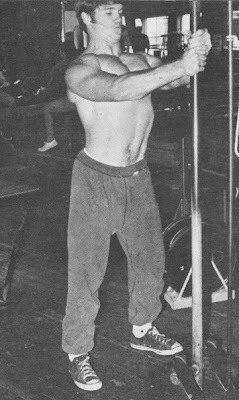 The average beginning lifter sees a picture of a well-known bodybuilder with a huge chest and immediately embarks on a program which includes lots of lat and pec exercises. Believe me, this is one of the silliest things you can do, because a truly big chest starts from within. The most pleasing aspect of stretching the rib cage is that it’s a pretty easy thing to do, relative to most other lifting and especially if one is still quite young. My own chest was 32” when I started to work out. It is now around 47” and I believe it would have been around 50” had I worked hard on my rib box during the first year or so of working out. Rib cage work and leg work go hand in hand. The reason for this being that the breathless condition induced by doing special squats called breathing squats help the stretching exercises used for enlarging the rib cage do their work a lot better. If you have enough will power you won’t do any pec work when you try this program. I suggest you complete the workout program to suit your own needs, but assure you once again you’ll do better by not doing any pec work while you are on this program. You will also find this will be a complete thigh workout and to complete your leg training you’ll only have to work calves. 1.) Squats – Ordinary squats with one difference. You are going to take four deep breaths between each rep. Even if you normally squat, in this instance I recommend a raised heel, either with proper footwear or a board under the feet. You will find that you are using less than your normal squatting poundage when including the breathing but don’t worry about it. In fact it means you are doing the exercise correctly. Breathe deeply four times, hold the last breath, and squat; breathe out forcefully as you come up. Do 12 reps and remember the breathing is as important as the squatting. Hold your chest high throughout the exercise, keep your stomach pulled in and concentrate on breathing high in the chest. It may feel awkward at first but you’ll soon get used to it. Do 3 sets of 12 reps. 2.) Cross-Bench Dumbell Pullover – Perform one set of 15 reps immediately following each set of squats. If you did the squats right you will be puffing like a steam engine. Don’t stop for a rest but go straight into a set of pullovers. Lie across a flat bench as shown, forcing the hips and buttocks down. This is important. Arch the chest over the bench with the head and shoulders clear of the bench. Keeping the elbows slightly bent, slightly out of lock to prevent shoulder injuries, let the weight back as far as you can, at the same time take the deepest breath you can. Remember this is NOT a musclebuilding exercise, but one designed to enlarge your rib cage, so all you’ll need in weight is about 15 to 25 lbs. If you use more weight you won’t be performing the movement correctly. Reg Park used about 25 lbs. when performing this exercise for this purpose. He wasn’t trying to impress anyone with his strength, which he had plenty of, but was trying to build a large rib cage, which he did. 3.) Breathing Squat – One set only. That’s right, one set. When you get through get through doing this one set you’ll probably feel like going home right then and there. Load the bar up to bodyweight, or, if you weight over 200 lbs. use about 190. Now all you have to do is 15 to 20 reps. During the first five reps take 5 deep breaths between each rep. I mean deep, as much air as you can possibly force into your lungs through the mouth. Hold your stomach in as tight as possible, throw out your chest and keep the breathing as high in the chest as you can, like you did in your other squats. Without stopping, do another five reps, but now increase the number of breaths to 7 between each rep. The deep, concentrated breathing should make your legs feel weak at this point and if your chest doesn’t feel about to burst you’re not breathing deep enough. Go straight into your next five reps again without stopping, but this time take 10 deep full high breaths between each rep. That completes 15 reps, which is enough, but if you still have something left try to do another few reps, complete with the deep breaths. 4.) Rader Chest Pull – In my opinion this is the most effective exercise for stretching the rib cage. Study the photo carefully. Perform this movement as soon as you are finished the breathing squats. Grasp the post as shown, about eye level. Now take a deep breath and pull down and toward you with both arms. Raise the chest as high as possible and if done properly you will feel a strong pull at the sternum or breast bone. The object is not to overarch the back but to lift and stretch the rib cage. Direct your attention to this aim and override the urge to simply arch the back. 10 to 15 reps will pull your rib cage like you’ve never experienced before. If it doesn’t, then assess and correct your performance until it does. 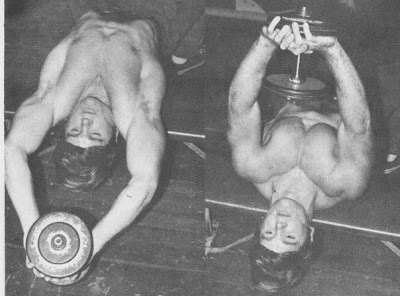 If you are willing to work hard on these exercises as prescribed for about three months straight (yes, I know it’s a long time) I will almost guarantee an increase of 3 to 5 inches depending on your age and how much pec development you have right now. The less pec you have, the more cage size you’ll gain. Incidentally, the Rader Chest Pull can be practiced anytime there is a proper setting available. So there you go, get chesty. It’s easy if you do it right.